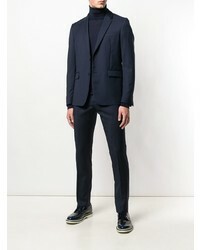 If you're on the hunt for a casual yet stylish outfit, try teaming a navy turtleneck with black chinos. Both pieces are totally comfortable and will look great paired together. Got bored with this outfit? Enter black leather chelsea boots to switch things up. 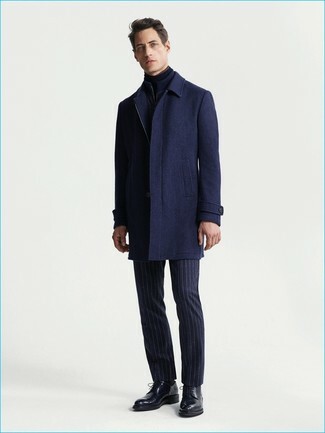 For a smart casual outfit, team a Mauro Grifoni perfectly fitted sweater from farfetch.com with navy vertical striped wool dress pants — these two items fit beautifully together. 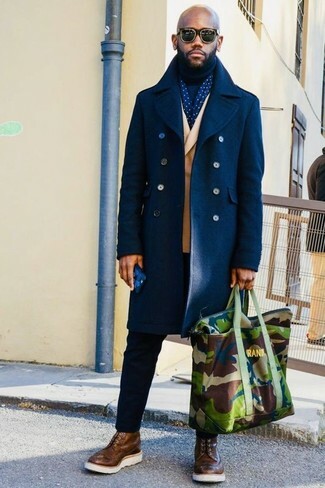 When it comes to shoes, this look is complemented really well with black leather derby shoes. 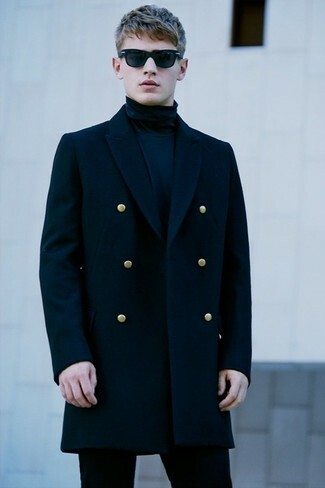 For a casually elegant look, consider wearing a Mauro Grifoni perfectly fitted sweater and a navy pea coat — these items fit really nice together. 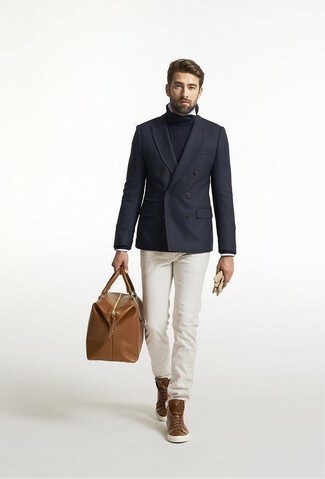 If you're after a casual yet on-trend getup, pair a navy turtleneck with beige chinos. Both pieces are totally comfortable and will look great together. For something more on the daring side to round off this outfit, make brown leather high top sneakers your footwear choice. 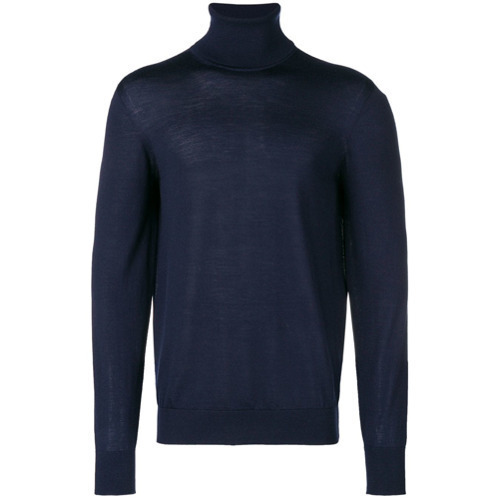 If you're after a casual yet sharp getup, pair a Mauro Grifoni perfectly fitted sweater with black chinos. Both pieces are totally comfortable and will look great paired together. 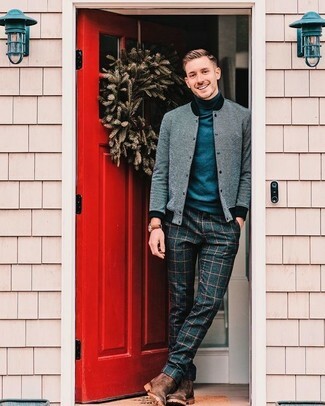 For a smart casual outfit, team a navy turtleneck with navy check wool dress pants — these two pieces fit pretty good together. When it comes to shoes, this getup pairs nicely with brown leather chelsea boots. 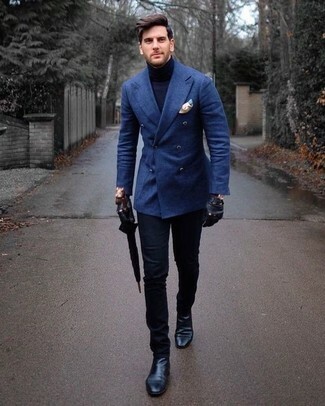 If you're after a casual yet stylish outfit, reach for a navy turtleneck and blue skinny jeans. Both pieces are totally comfortable and will look great together. 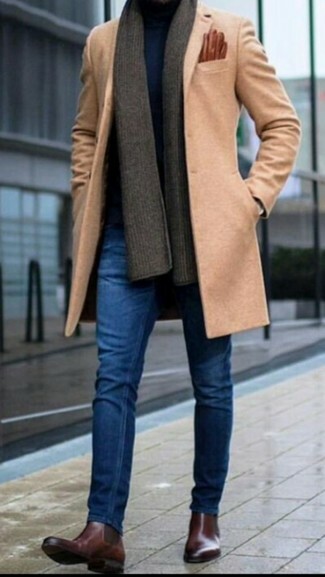 And if you want to instantly up the style ante of your look with one piece, add dark brown leather chelsea boots to the mix. 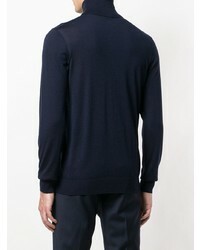 For dapper style without the need to sacrifice on functionality, we love this combination of a Mauro Grifoni Perfectly Fitted Sweater from farfetch.com and black chinos. Kick up the cool of your getup by complementing it with brown leather brogue boots. 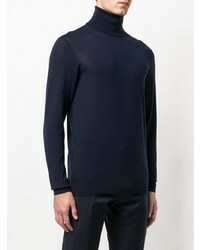 If you're scouting for a casual yet stylish look, team a navy turtleneck with beige chinos. 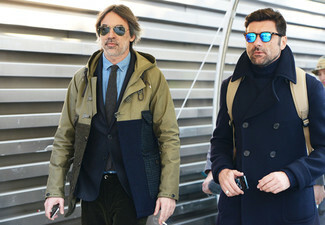 Both pieces are totally comfortable and will look great together.